This week I lead a workshop for medical couples and a very interesting thing happened. After some detailed questions it became clear that literally the only thing holding their relationships together now is the money. Each physician spouse was literally begging to be a priority in their doctor's life in front of the whole room. All they wanted was some of their time and attention. In each case the physician's time, energy and awareness was almost completely occupied by their career - and had been so for decades. The spouse wasn't even playing second fiddle here ... they were a member of the audience at best. Not good. In this blog post let me show you the psychodynamics of a medical marriage, the #1 tool to maintain the health and passion in your marriage if you are a physician (or married to one) and some recommended reading for all medical couples. 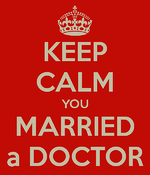 Most spouses do not marry their physician partner because they are a doctor. You do not typically love their practice as much as you love them as a person. Yet their medical career is a third party in your relationship. Their practice is part of the package deal in this situation. It is as if you married a person who has always (and will always) have a lover on the side. A jealous one at that. At times this lover is your spouse's #1 priority and that hurts if there is no balance. The only way to maintain the health and passion in your primary relationship is to create boundaries around your physician's relationship with their practice. Ideally the physician partner realizes this and takes it on as their responsibility. However, no one teaches this to you at any point in our medical education process. How do you carve out time for your relationship? Here are eight tools that have worked for hundreds of my coaching clients. Take some time each week to create your Life Calendar as a couple (and a family). Take a picture with your cell phone so you are always carrying your Life Calendar with you. Only now can you start saying the magic two letter word for life balance. That word is "No". Click here for the full Schedule HACK training. The single most important thing to have on your Life Calendar is Date Nights. Without time blocked out on your schedule where the two of you can reconnect, enjoy each other's company, talk about things other than work and the kids ... Date Night will NEVER happen all by itself. When was the last time you had a date night with your spouse? A real date night ... OK? Not a delivery pizza and a rerun of the Simpsons while you sit together on the couch. When was the last time you both got a little dressed up, went out to someplace new, turned your phones off and enjoyed each other's company? If it has been over 30 days ... you are overdue. I strongly recommend twice a month as your minimum frequency. Your dates serve to build your trust in each other. They connect you with what you love about your spouse when they are NOT a doctor. They are the only antidote for the hustle and bustle of life and a medical practice. Get one on your schedule now! The last action of any Date Night ... and the date is not over until this is complete - is to schedule your next date night. You are not done until there is another date night on each of your calendars. This way, if I were to stop you on the street and have you show me your Life Calendar ... it would always have at least one date night on it. I strongly suggest you grab your spouse or significant other and schedule date nights for the next three months. Get all six of them on your calendar now so you can begin to protect that time. At the end of your next date night you schedule another one three months in the future by adding it to the end of the existing list. Now you will always have six date nights blocked out on your calendar. You can begin to lean in and count on them. Buy season tickets. If there is an event the two of you enjoy, buy them in bulk. Get a season ticket for two. One purchase can provide you with a half a dozen fabulous dates. I personally have season tickets to our local Shakespeare company, the local Musical Theater and our Seattle Sounders MLS soccer team. That is over 30 date nights that Sherri and I both enjoy 100% (she shouts louder at the soccer games than I do) and I just bought tickets three times. If a physician has paid for a vacation they are highly likely (nearly 100%) to take it. If you keep it on your "someday / maybe" list, it is never going to happen. When ever I give this tip in a live training it gets a round of applause from the women in the audience. 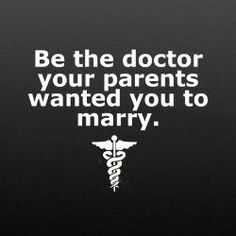 Guys ... listen up - whether you are the doctor or your spouse is. At least half of your date nights, try this and see what difference it makes. The guy picks the date, arranges for and picks up the baby sitter. Do not tell your wife/significant other where you are going. Just tell her what to wear and when to be ready. Let things unfold from there. Offer her your arm. Open the door for her. Treat her as if you are courting her all over again. Give that your best shot ... for just two dates a month and email me to tell me how it goes. Choose and practice a Boundary Ritual so you can let go of work when you are not in the office or hospital. If you are at home and not on call and still thinking about work ... the Boundary Ritual can help tremendously. And like all physician burnout prevention skills ... practice makes better. Here are some books the two of you can read together for many more tools and things to avoid in your relationship. "The Seven Principles for Making Marriage Work"
"The Way of the Superior Man"
It is not on purpose. It is the nature of being married to a physician. Without boundaries the practice acts like an 800 pound gorilla and simply takes over the available bandwidth. Use the tips above and anything else you can think of to spend more time with each other. Carve out your date nights and other experiences to create the possibility of enjoying each other's company more frequently. Tell us your keys to a healthy relationship and perhaps even your last really enjoyable date night experience.